2. What is a pressure ulcer and how is it caused? 3. What do pressure ulcers look like? 4. Does the grade of a pressure ulcer reflect how serious it is and whether a safeguarding referral should be considered? 5. Is it inevitable that pressure ulcers will develop? 6. How can pressure ulcers be prevented? 7. How can you know if a Pressure Ulcer was avoidable, or not? 8. If you assess that a pressure ulcer was avoidable, what next? Appendix A – Safeguarding Triggers for an individual with a pressure ulcer in any setting. This guidance is intended to inform staff who are concerned that a pressure ulcer (or other forms of skin damage) may have arisen as a result of poor practice, neglect, acts of omission or deliberate harm, and therefore have to decide whether to raise a safeguarding alert in line with the local multi agency Safeguarding policy and procedures. The guidance outlines basic information about the prevention and development of pressure ulcers and when these should be considered as a safeguarding concern. This does not replace individual organisations’ pressure ulcer guidance but provides advice on when pressure ulcers should be referred under the adult safeguarding procedures. Domiciliary Care Staff in relation to referring a pressure ulcer under adult safeguarding procedures and the management of pressure ulcers. The guidance could also be of interest to those who want to learn more about pressure ulcers. Body weight and some equipment (e.g. catheter) can press on the skin, other tissues and bone. This reduces the blood supply to the area and can lead to skin damage. Sliding or slumping down a bed/chair can cause damage by stretching and tearing the skin and deeper tissue layers. Poor moving and handling methods can remove the top layers of skin. Repeated rubbing can increase the risk. Pressure ulcers can develop very quickly and without appropriate intervention can become very serious. Any pressure ulcer can be painful and cause suffering but severe pressure ulcers can expose bone, and in extreme cases they can cause infection and become life threatening. Typically they occur in a person confined to bed or a chair by an illness and as a result they are sometimes referred to as ‘bedsores’, or ‘pressure sores’. Pressure ulcers are more likely to occur in people who are seriously ill, have a neurological condition, impaired mobility, impaired nutrition, or poor posture or a deformity. Pressure ulcers can occur in people of all ages. Please refer to images on the chart on the next page, p.3. Skin appears discoloured and is red in white people, and purple or blue in people with darker colored skin. Skin remains intact but it may hurt or itch. Skin may also feel either warm, cold spongy, or hard. Some of the outer surface of the skin (the epidermis) or the deeper layer of skin (the dermis) is damaged, leading to skin loss. Skin loss occurs throughout the entire thickness of the skin. The underlying tissue is also damaged. The underlying muscle and bone are not damaged. bruising deep tissue injury with top of skin intact or (image 4) Black hard necrosis (dead) tissue. The skin is severely damaged and the surrounding tissue begins to die (tissue necrosis). The underlying muscles or bone may also be damaged. People with grade four pressure ulcers have a high risk of developing a life-threatening infection. 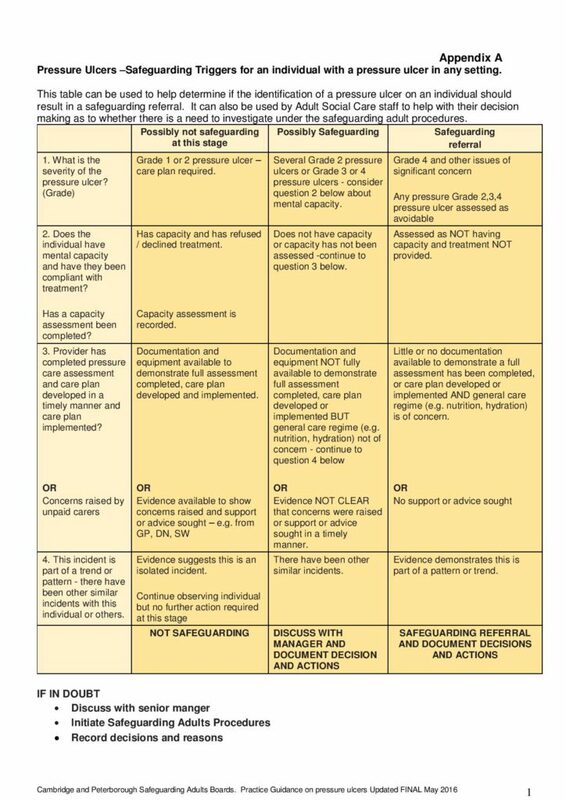 It has been recognised that it is unhelpful to rely solely on pressure ulcer grading in deciding the seriousness of the cause, or consequences to the patient. The grading of a pressure ulcer alone is also an unreliable indicator of whether or not there are possible related safeguarding concerns. Staff should ensure they follow their own organisation’s incident reporting policy and procedures around Pressure Ulcers. No. Pressure ulcers are mostly preventable or avoidable, providing the person has received appropriate care and treatment. However, for some they may still develop pressure ulcers despite them receiving appropriate care and treatment. monitor and evaluate the impact of the interventions; or revise the interventions as appropriate. ‘Unavoidable’ means that the person receiving care developed a pressure ulcer even though the provider of the care had evaluated the person’s clinical condition and pressure ulcer risk factors; planned and implemented interventions that are consistent with the persons needs and goals; and recognised standards of practice; monitored and evaluated the impact of the interventions; and revised the approaches as appropriate; or the individual person refused to adhere to prevention strategies in spite of education of the consequences of non-adherence. Where the person condition means that they cannot be repositioned frequently such as those with a spinal injury. When those receiving care as part of an end-of-life pathway may not be able to tolerate repositioning as frequently as their skin may require. Skin is an organ and can fail and breakdown into a pressure ulcer at the end of life. If you think a person is at risk of developing a pressure ulcer, you should undertake the following actions or refer to a district nurse. Early identification of people at high risk of pressure ulcers will ensure preventative measures can be implemented quickly. Any risk assessments should not be completed in isolation and clinical judgement is important. The Waterlow Risk Assessment Tool is a nationally recognised tool for identifying those who are at risk of developing a pressure ulcer (See example, Form A). Visual skin assessments must be carried out each time personal care is given, the findings must be documented and the care plan updated depending on the findings. Once all of the risk assessments have been completed, then a plan of care to prevent the development of pressure ulcers can be developed and appropriate measure put in place. This needs to be documented and reviewed so that all staff are aware of what care is required. Skin that is dry, sensitive or swollen will be more susceptible to becoming damaged by friction and shearing. If the individual insists on using talcum powder, they should be advised to use it sparingly. Any skin changes noted should be documented immediately and discussed with the individual and the multidisciplinary team. See forms B & C as examples of documentation used to record skin inspections and areas of concern. One of the best ways of preventing pressure ulcers is to reduce or relieve pressure on the areas of skin that are vulnerable. This can be done by encouraging or assisting the person to move or change position as often as needed to prevent persistent redness of the skin. If an individual already has a pressure ulcer, lying or sitting on this area should be avoided as much as possible. At risk people should have an individual care plan, identifying a repositioning regime. A chart may be needed to document this. People should be given advice about how to change their position in bed/chair and how often they should do this to prevent pressure ulcers developing. People that need support to move or transfer should be assisted in a way that reduces the risk of friction or shearing. There are many different types of mattresses and cushions that can help to reduce the pressure on bony parts of the body and help prevent pressure ulcers. It is important to document what is being used and that it has been checked to ensure it is being used correctly and not broken. All Health and Social care providers must ensure that if equipment has been given to a person to use that they are actually using it and that it is in working order. It is important to note that pressure relieving equipment will not eliminate the need for regular turning or changing positions. Eating well and drinking enough fluids is very important to help reduce people’s risk of developing pressure ulcers and effective wound healing. If there are concerns regarding whether a service user has sufficient nutrition and fluid intake, a food and fluid intake chart should be implemented. Moisture lesions must not be confused with pressure ulcers. These are usually on soft tissues (e.g. buttocks) and may look like a “nappy rash” but can be associated with pressure ulcers. Ensure that skin is clean and dry; consider assessment for continence aids and a possible referral to a GP or the continence adviser if required. Were their needs assessed? Was the assessment complete and accurate – was the assessment robust? Was a care plan developed to meet the needs identified in the risk assessment? Was there evidence that the care plan was implemented and reviewed? Was pressure relieving equipment provided in a timely way and appropriate to care needs? Was there referral to specialist help such as a tissue viability nurse? Have staff had appropriate training in the prevention of pressure ulcers? Was care documented and relevant charts completed? The care plan for the person should be reviewed to ensure that all measures are in place to prevent further deterioration and more pressure ulcers developing. Consideration also needs to be given as to whether the pressure ulcer needs to be reported as a Serious incident if the care was NHS funded. All staff involved with the health and care of people must have access to training, information and guidance on the prevention of pressure ulcers and skin damage. Such training, information and guidance must be appropriate to their role and responsibilities. All staff receive support and clinical supervision in the form of a discussion with a peer or manager / professional on a regular basis regarding complex cases or scenarios which the member of staff would like to review. Organisations and agencies should check trends and patterns of pressure ulcers including grades of pressure ulcers, equipment used and any contributing factors so improvements can be identified and implemented. Compliance with performance indicators should be included in contracts with care homes and care providers and compliance should be monitored. Refer to the Peterborough Safeguarding Adults and Cambridgeshire Safeguarding Adults Multi-Agency policies and procedures available on the on the links below.